The vacancy rate for office space in the Austin metro has remained below 9.0% for 10 consecutive quarters, or Q4 2016. 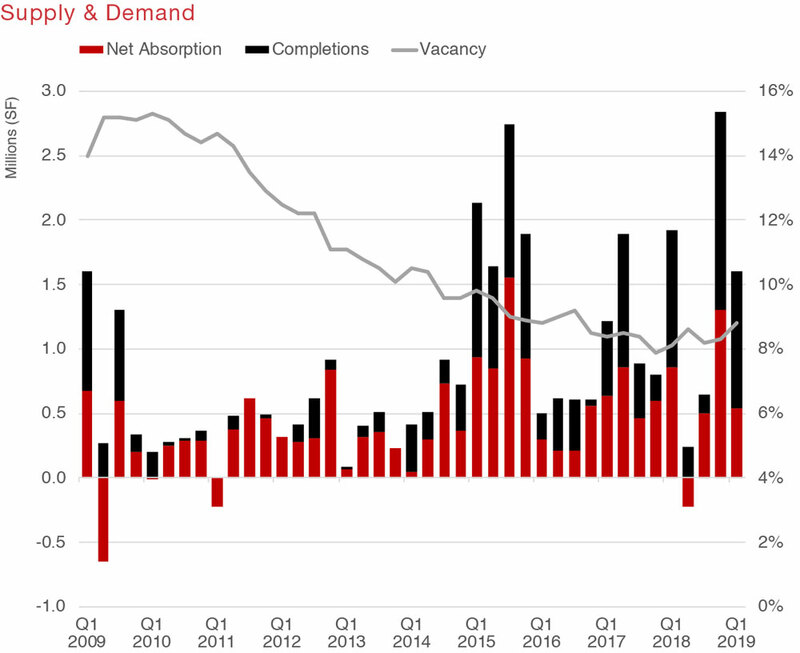 The record-breaking levels of new construction have been pushing the vacancy rate up slightly, ending Q1 2019 at 8.8%, up 50 basis points quarter-over-quarter, and an increase of 70 basis points year-over-year. Net absorption was positive 539,000 sq. 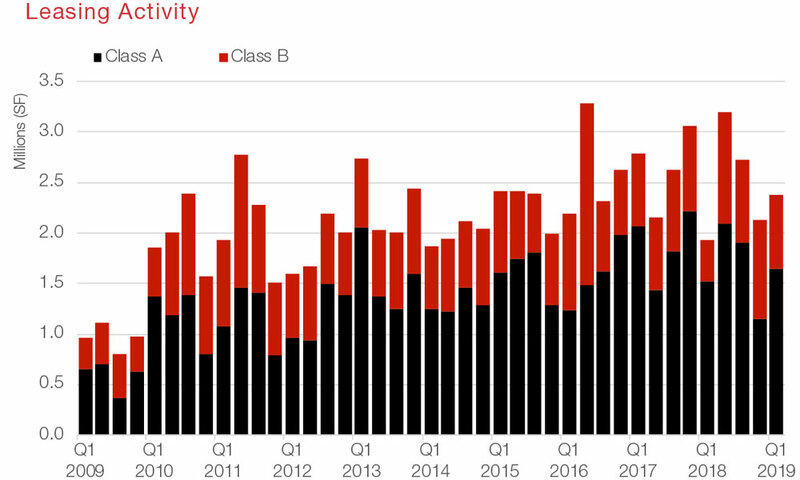 ft., down from the second-highest quarterly absorption amount recorded by NAI Partners in Q4 2018 at 1.3 million sq. ft. The highest quarterly amount of absorption occurred during the third quarter of 2015 at 1.6 million sq. ft. New construction delivered during the first quarter stood at 1 million sq. ft., with 93.5% of that space occupied. Full-service average asking rents are at $35.32 per sq. ft., remaining between $34.00 to $36.00 per sq. ft. since Q2 2017 (eight consecutive quarters). Austin added 23,800 net new jobs, growth of 2.3%, in the 12 months ending in February, making Austin the 11th-fastest-growing major metro. Wholesale trade was Austin’s fastest growing industry (8.2%) while professional and business services added the most jobs (6,200) over the last 12 months. On a seasonally adjusted basis, Austin’s February unemployment rate was 3.0%, down from 3.2% in January. The statewide seasonally adjusted rate is 3.8% in February, unchanged from January. The national rate is 3.8%, improved from 4.0%., according to the Federal Reserve Bank of Dallas. On the housing front, the market remained active as existing-home sales in the metro increased 7.1% from January to February and 4.1% from this time last year. The median home price in Austin decreased in February to $301,418, down 1% year over year. In the last five years over 12.6 million sq. ft. has been delivered, expanding the Austin office market by 16.4%, totaling 87.5 million sq. ft. of inventory. 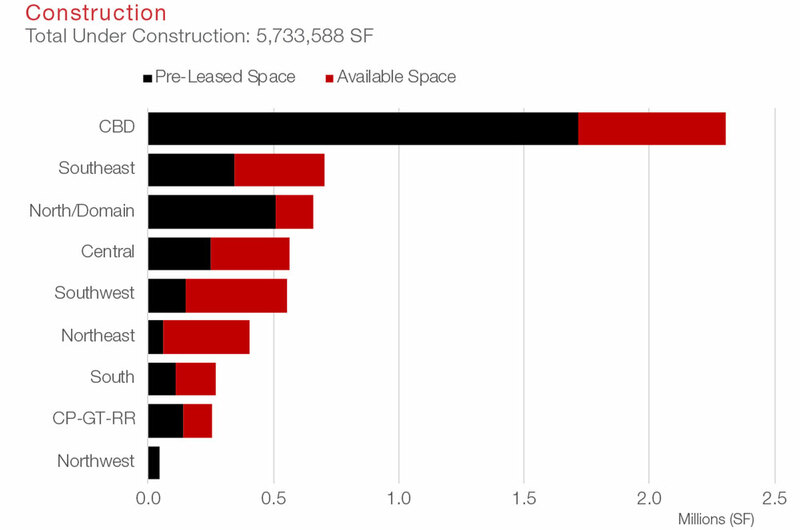 There are 44 office projects covering 5.7 million sq. ft. of space under construction in the Greater Austin area—more square footage than at any other time in the metro’s history, exceeding the record of 5.1 million sq. ft. in 2001, when there was 57.3 million sq. ft. of inventory. Developers are moving swiftly to keep up with demand. 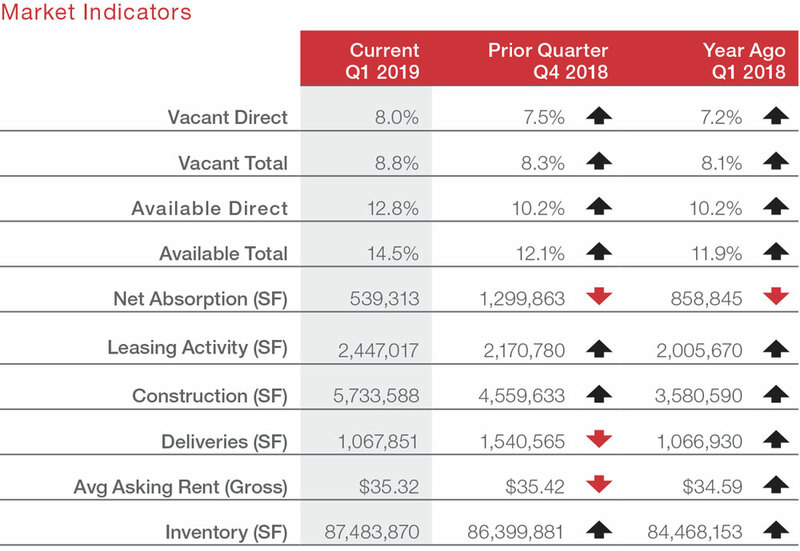 Construction activity at the end of Q1 2019 (5.7 million sq. 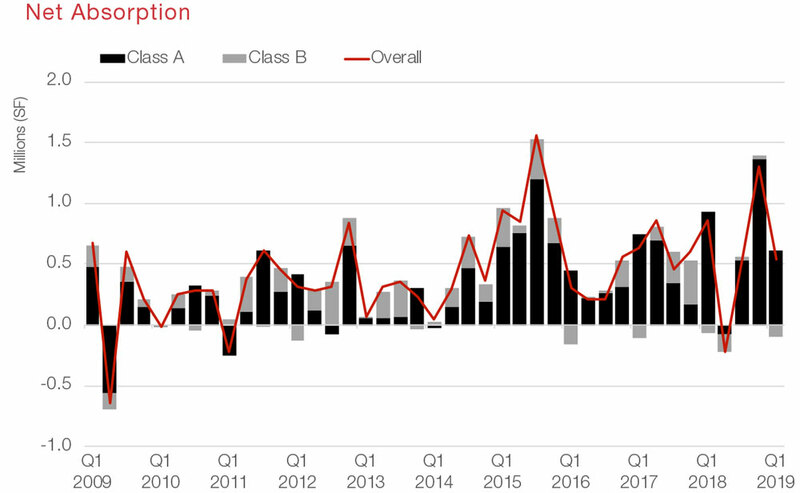 ft.) was up 60.1% compared to the end of Q1 2018 (3.6 million sq. ft.). In early March, The Quincy, a 30-story mixed-use tower being developed at 93 Red River St. broke ground. The new high-rise will be in the Rainey Street district of Austin’s CBD, located between Driskell and Davis streets—where there are currently two parking lots. It will bring together one floor of retail, 19 floors of residential units, three floors of office space, plus seven levels of above-ground parking. The top floor will be an indoor/outdoor sky deck overlooking Lady Bird Lake. It is scheduled to open in early 2021. Austin’s appeal led to 136 tech companies relocating or expanding in the area during 2018, with plans to create close to 18,300 jobs, according to CoStar. Word on the street has Google leasing the entirety of Block 185, a 35-story, 790,000-sq.-ft. office tower downtown (with preparation at the site underway), and leasing the entire seven-story, 150,000-sq.-ft. Plaza Saltillo development in East Austin. Meanwhile, Amazon plans to lease around half of Domain 10, a 15-story, near 300,000-sq.-ft. office building in northwest Austin near Apple’s existing multi-building campus. Less than a mile away, Apple’s proposed $1 billion, 133-acre, 3 million-sq.-ft. second campus could open by the end of 2021. In 2018, Indeed announced plans to add 3,000 jobs in Austin, and in preparation, signed a lease taking multiple floors covering 307,000 sq. ft. in what will be Austin’s tallest tower, Block 71. Located in downtown Austin, construction on the project is scheduled for completion in 2021. In March, the job search engine goliath is extending its expansion in Austin, leasing the Domain Gateway office building in its entirety. The company’s most recent lease in the five-story, 183,911-sq.-ft. office building at 2900 Esperanza Crossing is located in the mixed-use development The Domain in north Austin. The move will allow Indeed to accommodate thousands of employees over the next few years. 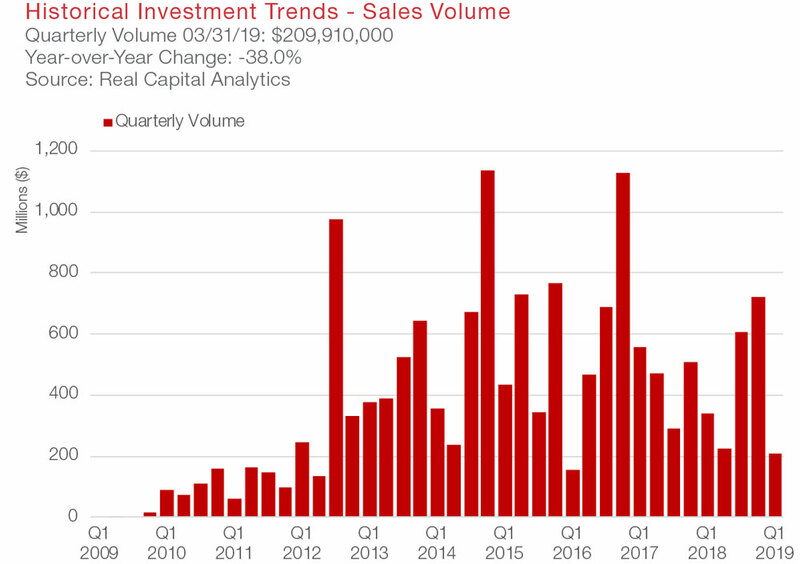 Real Capital Analytics data reports office sales volume for Q1 2019 in the Austin area at $209.9 million compared to Q1 2018 at $338.3 million, resulting in a year-over-year quarterly volume change of -38.0%. The primary capital composition for buyers in 2019 was made up of 79.9% REIT/listed investors, and 16.7% private. For sellers, the majority was 79.9% REIT/listed, and 11.0% private. In March, Taurus Investment Holdings sold Travesia Corporate Park, a three-building, Class A mixed-use office park located in the North/Domain submarket. The buyer, Jefferson River Capital paid $40.9 million for the asset. The 176,161-sq.-ft. development is on 24 acres at 3800 Quick Hill Road and consists of three buildings of 46,200, 62,250 and 68,171 sq. ft. The property was 100% leased at the time of sale to tenants Hewlett-Packard, Sonic Healthcare and Protect America. Office asking rents in Austin have risen to $35.32 per sq. ft., up $0.73 per sq. ft. year-over-year. 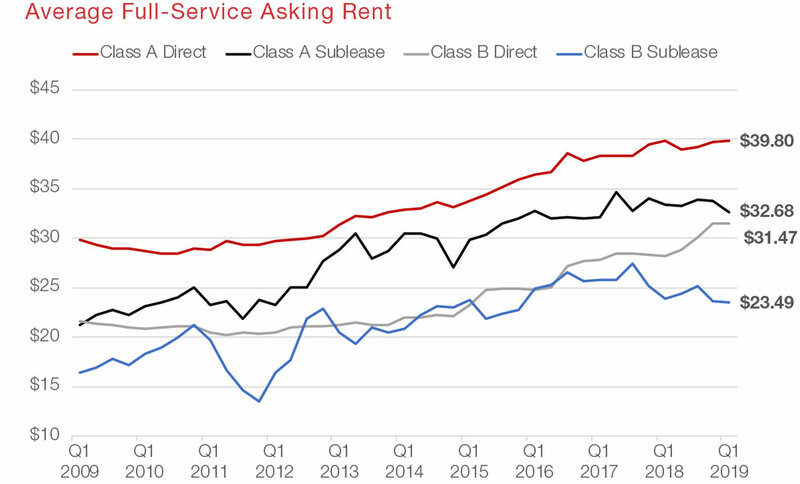 Although concessions such as free rent and tenant improvement allowances make posted rents less meaningful as a market indicator, the price of Austin’s office space continues to climb. 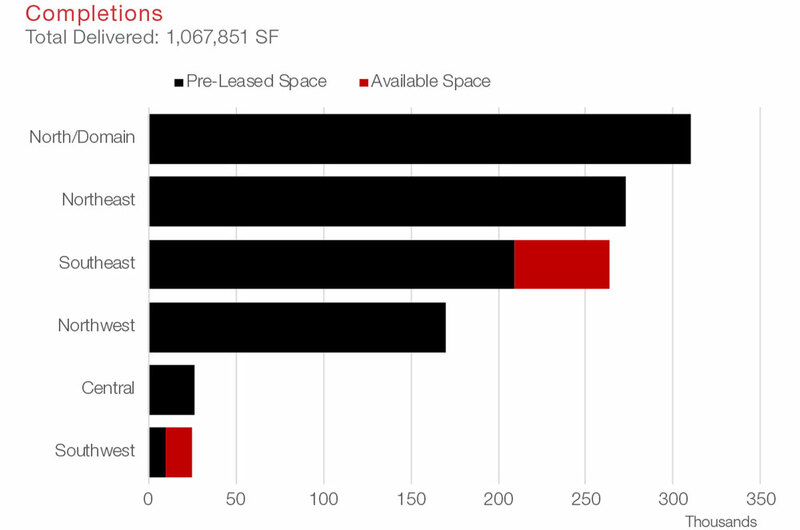 Asking rates for existing Class A space in the CBD is at an average of $49.45 per sq. ft. Existing buildings with the most available Class A office space in the CBD include 600 Congress Ave., One American Center (133,797 sq. ft.); 401 Congress Ave., Frost Bank Tower (100,232 sq. ft.); 111 Congress Ave., One Eleven (98,635 sq. ft.); and 98 San Jacinto Blvd., San Jacinto Center (98,400 sq. ft.). There are four Class A buildings under construction in the CBD with available space; 200 W. 6th St., Block 71 (265,134 sq. ft.); 1836 San Jacinto, Innovation (207,856 sq. ft.); 93 Red River, The Quincy (77,782 sq. ft.); and 1400 Lavaca St., SXSW Center (35,557 sq. ft.). These four existing buildings, and four under construction, contain 1.0 million sq. ft. of first-class available space for lease.